Hi everyone! This month, I’m proud to announce that one of my poems will be featured at the Black Opal Arts exhibition. Black Opal Arts is a platform for writers and artists to explore the darker side of their craft. Tonight, April 12th, Black Opal Arts presents NOCTIS, a night of celebration for all things horror. There will be artwork to admire, stories to hear and cake to eat. I’ll be reading out my poem there, so if you’re looking for a spooky evening in Glasgow, come along to NOCTIS! 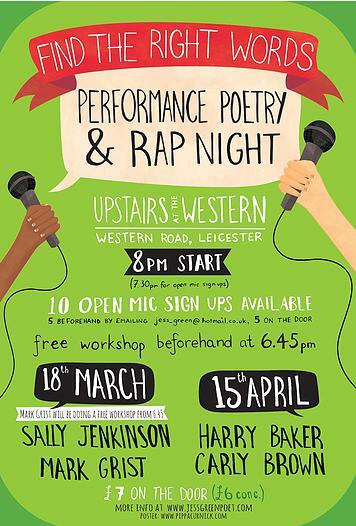 And then next week…I’ll be travelling down to Leicester, England, where I’ve been invited to be a guest poet at ‘Find the Right Words’, a night of performance poetry and rap. I’ll be performing with the fantastic and hilarious wordsmith Harry Baker, former World Champion of Slam Poetry. There’s an open mic as well. If you’re in the area, definitely come join us! Check out this website for further info.